The former Arsenal star replaced Leonardo Jardim as head coach last week but could not inspire them to avoid a fifth-straight defeat on Saturday. 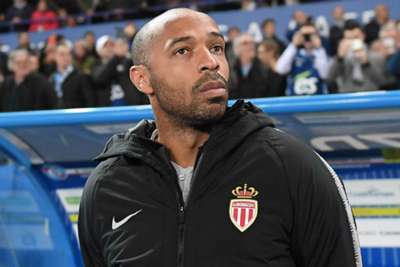 Youri Tielemans' injury-time penalty offered only consolation to the visitors, but Henry insisted there was promising aspects to his side's performance. "We try to put something in place that worked from the start, and then we concede this goal that I don't need to describe," he said. "It's a human error. I don't want to overburden anyone. "Then, we reacted, we had chances but we were losing 1-0 at half-time. We tried to reorganise the game, but unfortunately Sam was sent off. After that, it was even harder. "I want to focus on the positive within the negative, otherwise we won't move forward. The positive thing is that we tried to keep playing, even with 10 men. "The game could have turned in our favour, but it didn't. In addition, we lost [Radamel] Falcao at the beginning. It wasn't the dream scenario."